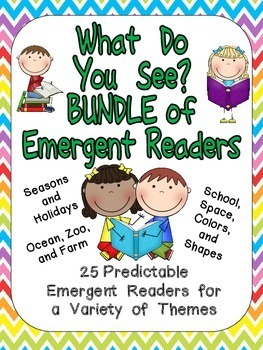 This bundle of emergent reader little books will keep your young readers engaged in reading practice for hours!! 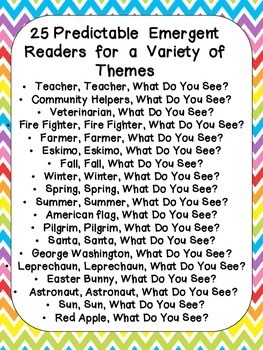 These books would be great to use for browsing boxes, independent reading, guided reading groups, or Read to Self. "____________, _________, what do you see? I see a ________ looking at me." Each book includes the same text on both the top and bottom of each sheet of paper to make copying, sorting, stapling, and cutting easy to create a class set of little books!! Community Helpers, What Do You See? Veterinarian, Veterinarian, What Do You See? Fire Fighter, Fire Fighter, What Do You See? Farmer, Farmer, What Do You See? Eskimo, Eskimo, What Do You See? Fall, Fall, What Do You See? Winter, Winter, What Do You See? Spring, Spring, What Do You See? Summer, Summer, What Do You See? American flag, American flag, What Do You See? Santa, Santa, What Do You See? George Washington, What Do You See? Leprechaun, Leprechaun, What Do You See? 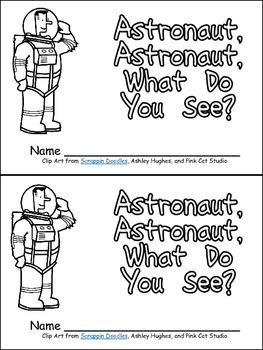 Astronaut, Astronaut, What Do You See? Sun, Sun, What Do You See? Tree Frog, Tree Frog, What Do You See? Diver, Diver, What Do You See? Zookeeper, What Do You See? Cowboy, Cowboy, What Do You See? 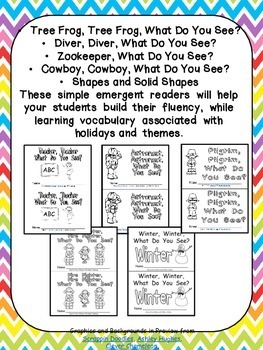 These simple emergent readers will help your students build their fluency, while learning vocabulary associated with holidays and themes.